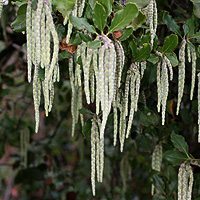 Garrya elliptica or ‘Silk Tassel Bush’. A small evergreen tree with good green foliage Garrya elliptica is grown as a background or feature tree as well as for the ‘catkins’ that cover the tree during winter. Hardy and reliable it is a tree that requires little care once established. Coming in two main forms, this winter flowering plant is available in Australia as Garrya elliptica ‘Evie’ and the popular Garrya elliptica ‘James Roof’. G.elliptica ‘Evie’ is also suited tom growing as an espalier. Both forms have the hanging ‘Silk Tassels’ that are a feature in the winter garden, ‘Evie’ is perhaps slightly smaller growing. G. elliptica or ‘Silk Tassel Bush’ are a fairly hardy plant that grow well in a range of conditions from the Dandenong Ranges in Victoria to coastal areas. Plants can be pruned back to create a more bushy habit. We have found then to be reasonably drought tolerant once established. Wholesale Nurseries, Tube Stock.